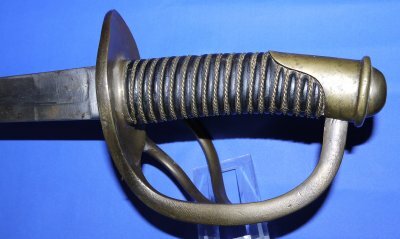 In good condition, a scarce 1840 Model US Old Wrist Breaker Cavalry Sabre by Clemen & Jung. 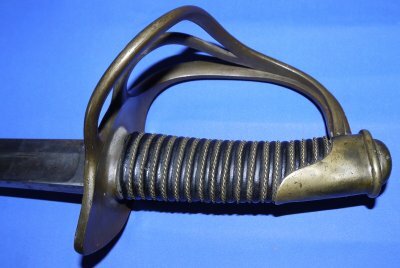 Guaranteed an authentic 1840 Model US Old Wrist Breaker Cavalry Sabre, not one of the hundreds of wannabe generic swords other dealers unsubstantially purport to be US cavalry sabres. This sabre was made by Clemen & Jung of Solingen; it bears their US style mark ("C&J" within a US market box). We bought this at auction in the UK from a US seller with a collection of various US antiques. The 35 7/8 inch blade is in very good condition with very little patina / rust. Blade a little loose in the hilt. The hilt good as are the original leather grip and twisted grip wire. 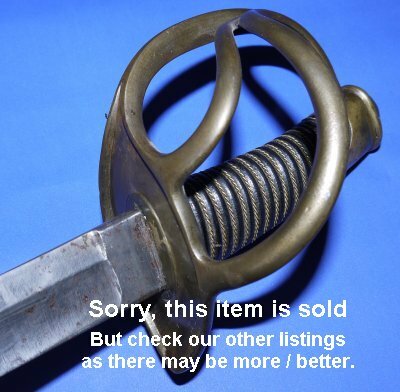 Really, a scarce authentic 1840M sabre, especially scarce outside the US. Yours for £? (too late, now sold). Please quote item reference AE14 (0674). Further / full sized images available upon request.